In Canada, Counter Mats are the most effective point of sale advertising available. Our custom printed mats allow every customer to see your ad message every time they make a purchase. Great for retail stores, restaurants, auto parts stores, and beverage promotions. Available in a variety of shapes, sizes, and materials to meet any budget. The next time you go into a retail store, chances are you'll see Point-Of-Purchase Counter Mats. Don't miss out on the promotional impact of our custom printed Counter Mats and discover your untapped sales opportunities. Our extensive Counter Mat product line features Magnetic Edge Window Mats, See-Thru Mats, Slide-Thru Mats, Hard Vinyl Surface Mats, Sealed Edge Mats, Bar Mats, Foam Mats, Fabric Mats, Ultra Thin Mats, Adhesive Mats, and Recycled Countermats. Best of all, Canadian customers can take advantage of our global reach which allows us to offer the best quality Counter Mats at the best price. MagnaMats™ are Interchangeable Magnetic Window Countermats. These versatile insert-style magnetic countermats will keep your important information viewable, organized, and safe from daily elements that could be damaging...one countermat does it all. Subsurface printing ensures your image will remain vibrant and untarnished, while our unique magnetic-frame construction keeps contents clean and in place. MagnaMats™ Window Countermats - Great quality and durability for your Point-of-Purchase needs! A special scratch resistant surface provides great durability to extend the life of your advertising investment. Popular blank black mats are available for immediate shipping. We can create any size or shape to meet your needs! Size Options: 13"x19" (Holds an 11"x17" Size Insert) - Custom shapes and sizes available. Store owners will find the original See-Thru™ Countermat extremely useful near any point of purchase location. Advertising material, daily specials, legal notices, store policies, etc. are conveniently located at the customer's fingertips under the patented lift-up top cover. Change your ad message as often as you like. Great for convenience stores, hotels, auto parts stores, restaurants, front desk, service counter, retail outlet, or any point of purchase location. Inserts for See-Thru™ Countermats are available with rounded corners to exactly match the mat's size and shape. Sealed Edge Counter Mats are air-tight and waterproof. These mats work great in heavy traffic areas like automotive and hardware stores, heavy equipment shops, beverage dealers, and restaurants. The scratch resistant polyethylene surface can stand up to the toughest beating. The edge seal is 1/8" outside your printed design area and comes in black, white, or RF seal. Sealed Edge Counter Mats offer the perfect balance between durability and value. BAR MATS are an affordable way to captivate your target audience. Our new multi-colored, rubberized MOLDED VINYL COUNTERMATS are the most durable and water-proof countermats around. Bar Mats are manufactured using a proprietary formula to produce a tough, rubberized vinyl with all the colors molded in... NOT painted or printed. Perfect for high-traffic waitress stands, restaurants, bars, beverage dispensing areas, gaming mats, pet stores, plumbing and industrial equipment stores, hardware stores, and anywhere a rugged, water-proof counter mat solution is needed. Our Eco-Friendly Recycled Countermats are covered with durable heavy duty vinyl and backed by non-skid recycled rubber. The base is 100% post-consumer recycled material, latex-free (contains SBR synthetic rubber), and 3/32" (2mm) in thickness. The durable textured polymer surface protects your image while allowing it to POP in brilliant color and detail. Our PET (polyethylene terephthalate) Soft Surface Counter Mat is a recycled fabric top mat on a 50% recycled heavy-duty rubber base. We also offer our standard polyester fabric on a 50% recycled rubber base. Foam Based Counter Mats often offer a less expensive alternative to rubber or vinyl based products. Foam is a lightweight, practical, and cost-effective promotional solution. The base material for these hard surface mats is a Latex-Free, light weight foam. The foam base is non-skid and light on the pocket-book. Great display advertising for banks, credit unions, hotels, educational environments, real estate offices, pharmacies, health and beauty counters, and retail convenience stores. Our huge Fabric-Top Point of Purchase Counter Mats and Desk Mats are like having a billboard at your cash register, with all the punch you need to maximize your message. Our Polyester Fabric Surface is a smooth cloth cover with a canvas-like feel and durability. Fabric Top Counter Mats offer an economical solution to countertop advertising where hard-top mats are not practical. Full color and a wide variety of base sizes make this mat a worthy contender. OUR MOST ECONOMICAL COUNTER MAT. Available in a .24 inch thin non-skip vinyl base and a removable/repositionable lo-tac adhesive base to keep the mat flat and in place. Pads can be custom printed on the under-side of the clear cover with company logos or promotional ads. 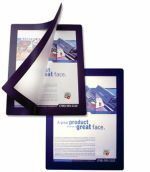 Ultra-Thin Counter Mats offer budget-friendly point-of-purchase display of your company logo and advertising message. The extra thin, durable materials are easy to clean. Our Economy Matte Surface has the look and feel of our Hard Vinyl Surface Mat. Both use rigid vinyl creating an exceptional counter top surface. The major difference with the Economy Matte Surface pads is that your artwork is custom printed on paper, then laminated between the hard vinyl surface and the base material. The hard vinyl surface protects the artwork and allows the colors to "Pop!" for eye-catching appeal. Our Adhesive Counter Mats are an economical hard surface countermat that is printed on a unique lo-tac adhesive non-slip base. This repositionable pad is thin and lightweight, reducing overall cost. Comes with a peel-off liner to cover the backing during shipping. Simply peel off the liner and place where needed on your counter top. Permanent adhesive options available. Copyright © 2018 BetterCountermats.com, A Division of BetterMousepads.com. All rights reserved.